Map Idea. PLR - Barber Poles of Hell. Discussion in 'Mapping Questions & Discussion' started by Aki, Sep 9, 2011. Last night for whatever reason this map idea conceptually popped into my head. A payload race based on a screw path like you see on a barber pole. Like this one. The image I gave has two paths spiraling around one column. Those paths don't crossover on a pole. In a map the "pole" can be hollow (say, an office tower under construction) to allow crossfighting. First question - how often should this happen? Next question - I gather the cart rolls backwards automatically when not pushed. So level spots for "breathers" may be necessary. How often. Another concern. Since the path spirals it can be very long on a relatively small map. How long is too long? One pole or two? If two poles how close? How many floors does a scout lose if he jumps from one to the other? Spawnpoints. I'm inclined towards two towers so that the spawn points can be at the top of each tower. The very first map I ever built was a two tower control point map. I gave up on it because in testing the vertical space could be covered via falling too quickly. However, a payload race may not have this problem since the movement rate of the cart is a restraining factor. The last reason I bring this up here is this is such a dirt simple premise I'm guessing it's been done before. If so I'd like to see what others have done with the premise. The image I gave has two paths spiraling around one column. Those paths don't crossover on a pole. That would be quite innovative to not let the paths of a plr cross over. I am afraid that this will focus the average pubber more on searching for enemies than actually pushing the cart. The tower must be very small I think for when you want the map to almost entirely be made out of rollback zones, this will be literally like the infamous sissiphus trying to roll a rock up a mountain but the rock rolling down every few meters. As I don't see a successful map happening in which the teams are virtually isolated from one another, I would say as often as possible. As it is not a normal plr map (rolling back always), I suggest half the length of a normal plr stage as maximum. One pole. Otherwise the teams are just completely isolated from one another which is not fun and makes sniper an overviable class. Okay, that's different from what I thought. Don't take this as a command, but I srsly would only build 1 tower for plr; with the spawnpoints at the starting point of the track; on opposing sides of the spiral tower. Can you turn off auto-rollback in PLR if it ends up being to much of an issue? I know you can in PL. I had a similar idea to this. It was going to be a sister map to my koth_helix and koth_helix_tower. Maybe you could make it better than I could, and I probably will never make it, and I make no claim to own the idea, so go ahead. In PLR, auto-rollback is disabled by default, unless you're on a rollback/forward zone. 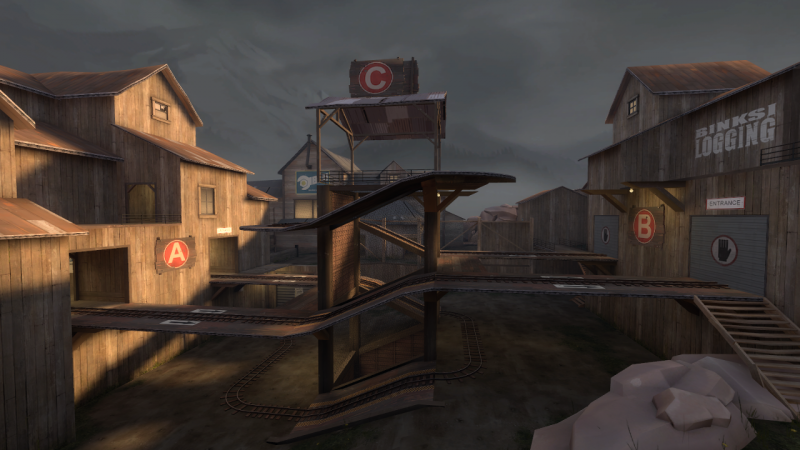 Also, in PLR, the only "Checkpoints" are at the end of a round/map (it it's one stage). My thinking is that a large spiral would not be ideal, but that perhaps a small central tower that is wrapped around and has wide loops that snake off like in thunder mountain point c could wok. Like this, but with two carts, and it'd be symmetrical. Having two towers near each other with a path that wraps between and around both could be interesting as well. I feel like this sounds cool in concept, but I think the best way you could incorporate this would be the spiral inside of a building, so that players aren't restricted to playing on the spiral. Also, I hate to be a buzzkill but I think if you do a spiral those tracks will need to be modeled, because it's crazy difficult to do that stuff in hammer. You could, however try searching for a tutorial on interlopers.net on the topic, I know I saw one, but just know that this won't be simple to construct. Ok. Well, I will do a mockup in hammer and post it out. I'll just colorize the paths. I'll go with a single tower, and the paths will entwine in a double helix fashion. The first mockup will not be playable - it will be meant for viewing in the editor as a model of the paths. Some of the issues that have been brought up concern me, others not so much since I envision the tower being mostly hollow with enough crossdecking so that the teams can easily interfere with each other. Roll back could be fun, but also lead to stalemates. The model will make this clear.